A memorial event for Jalen Paukan ’15 will be held Wednesday, Jan. 21, at 7 p.m. at the Old Union Clubhouse Ballroom. Paukan was a psychology major from the Yup’ik Eskimo village of St. Mary’s, Alaska, and an active member of Stanford’s Native American community. On Jan. 6, students were informed of Paukan’s death. Campus police responded to concerns about Paukan’s welfare at his Mirrielees residence on Jan. 5. The Santa Clara County Medical Examiner-Coroner’s Office reported the cause of death as suicide. News of his passing has reverberated around Stanford and his hometown, which is 450 miles by air from Anchorage, Alaska, resulting in an outpouring of love and support for Paukan and his family and friends. 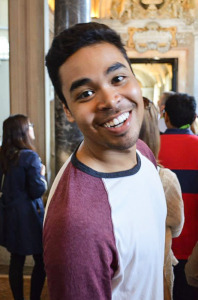 Paukan was an active community participant and staff member of the Stanford Native Immersion Program and the Native American Cultural Center, using his creativity and technical skills to share his cultural roots. “From the beginning, he generously shared his Native Alaskan identity and connection to culture, drumming, singing and dance with the Stanford community,” recalled Karen Biestman, Stanford lecturer and Associate Dean and Director of the Native American Cultural Center. “I remember being deeply moved when, after apologizing to the group for not having recorded music, he performed a powerful Eskimo song and dance – a cappella – stamping his feet on the floor to replicate a drum and never missed a beat, teaching and interpreting along the way. Paukan was known for being a bright young man with a colorful personality, a positive presence that made anyone feel welcome and a wide smile that would light up any room. Having studied abroad in Florence, he beamed when sharing memories of his time abroad and speaking of his close family and friends. In the eyes of others, his influence not only made him an incredible friend and community member, but a mentor figure to aspire to. “Jalen was probably one of the greatest role models that our school ever had,” wrote DeWayne Bahnsen, Jalen’s high school principal, in an email to The Daily. “His senior year he was the president of student government, captain of the basketball team, was a starter on the volleyball team that went 16-0 during the regular season. There is a Facebook page called “Remembering Jalen Paukan” where anyone can reflect on his life and impact, tell stories of his life and share pictures taken with him. “To the guy that taught me happiness in times of sorrow, who taught me to keep my priorities organized while still making time for fun, who taught me that family isn’t just those who are related by blood and who taught me that love is one of the most important things in life and money will never be able to buy it, rest in paradise, Jalen Jimmy,” one post said.